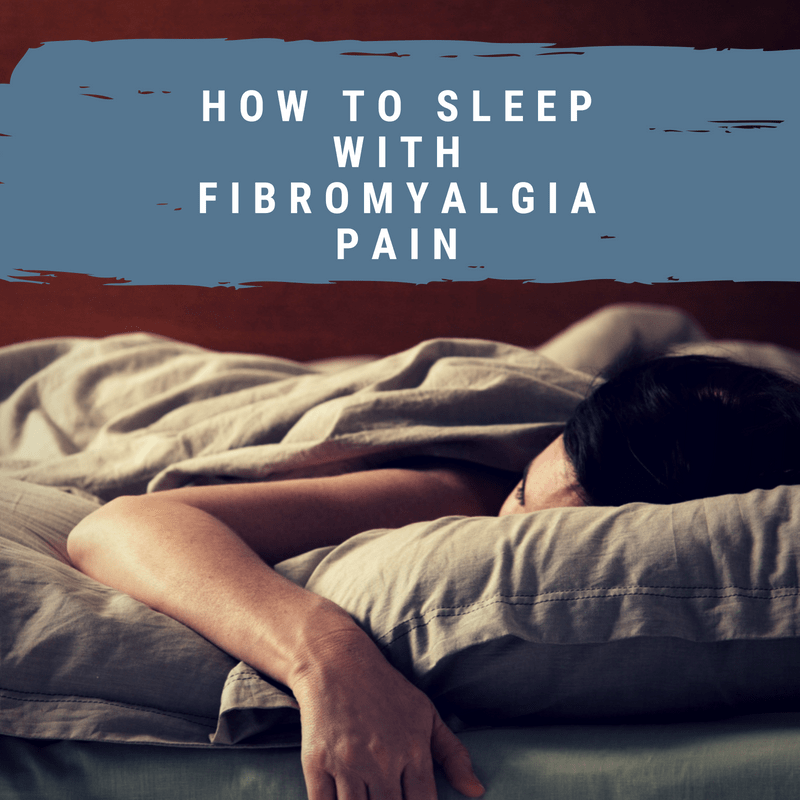 You’re fed up with being wide awake night after night, so you search the internet high and low for a natural insomnia remedy that will help you get some zzz’s. You’ve scoured tons of sites and asked around in groups you’re a member of to find out what actually works. Then you find it. That one new remedy you think is going to work for you. Everyone is raving about how it’s helped them finally fall asleep and stay asleep. Even better, some people have even said it took care of their insomnia. You’re like, wow, I’m going to try that! So you get it, take it, aaannndd……..you’re still awake. What the heck? Aren’t natural remedies supposed to work and get you snoozing again? Why is this working for everybody else but not for me? Here’s why natural sleep remedies may not be working for you and what steps you can take to make sure you get the best results from any remedy you try. 2 First, What Keeps you Up at Night? 6 Don’t Sabotage Yourself….Sleep Clean! The only thing more confounding and aggravating than the inability to sleep is taking a natural sleep remedy many people swear by and still not being able to sleep. I remember when I started looking for natural ways to cure my insomnia. I would read through home remedy books and the internet to try to find one that would help me sleep. 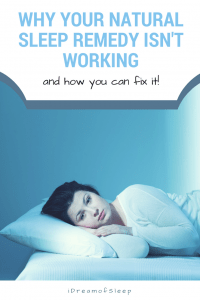 I became jaded with trying to fix my insomnia naturally because it seemed like nothing I tried worked. Eventually I worked out a regimen that corrected my sleep issues. Except for a bad spell every once in a while, I now sleep normally and I’m happy to say I beat my insomnia using natural methods. 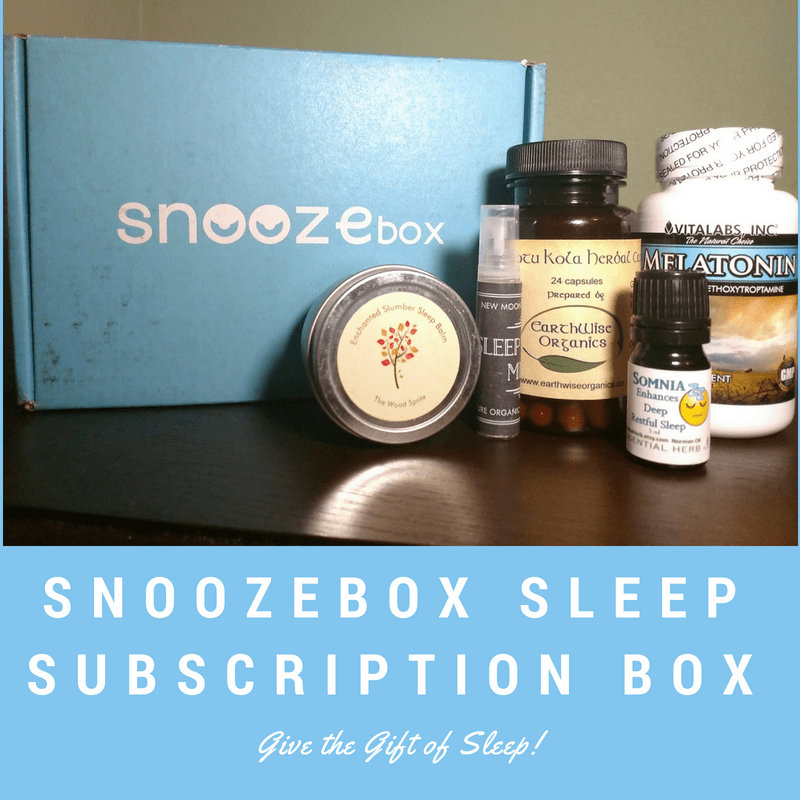 Now I know that when I was trying out natural sleep remedies in the beginning I was making the same mistakes a lot of people make when they try to treat their insomnia naturally. 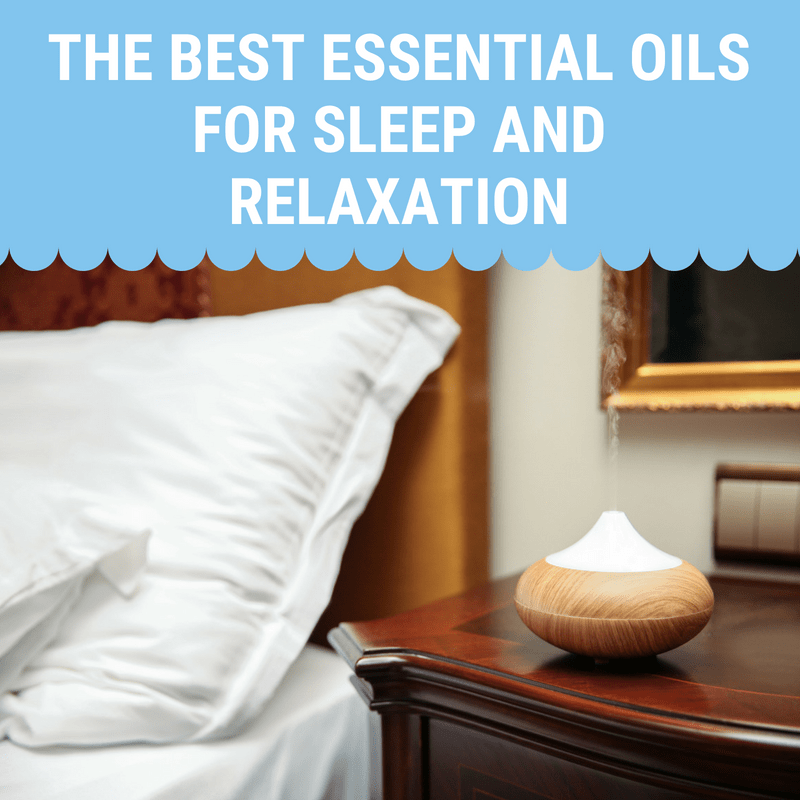 Things like what sleep remedy you use, how long you use it, even what kind of insomnia you suffer from are key factors when it comes to choosing and using natural insomnia remedies the right way. First, What Keeps you Up at Night? I think I saw an eye roll there. 😆 You probably think it’s a stupid question because if you knew that, you’d be sleeping, am I right? But it’s an important thing you need to ask yourself before you pick a remedy to help you sleep. It’s critical to hone in on what’s keeping you from sleeping so you can choose the right sleep remedy. You’re just setting yourself up for failure if you try a remedy that helps boost magnesium levels but you have problems with a racing mind. It’s just not going to work for your particular sleep problem. For example, if you can’t sleep because you’re stressed out about not sleeping and how insomnia is impacting your health, you probably suffer from sleep anxiety. 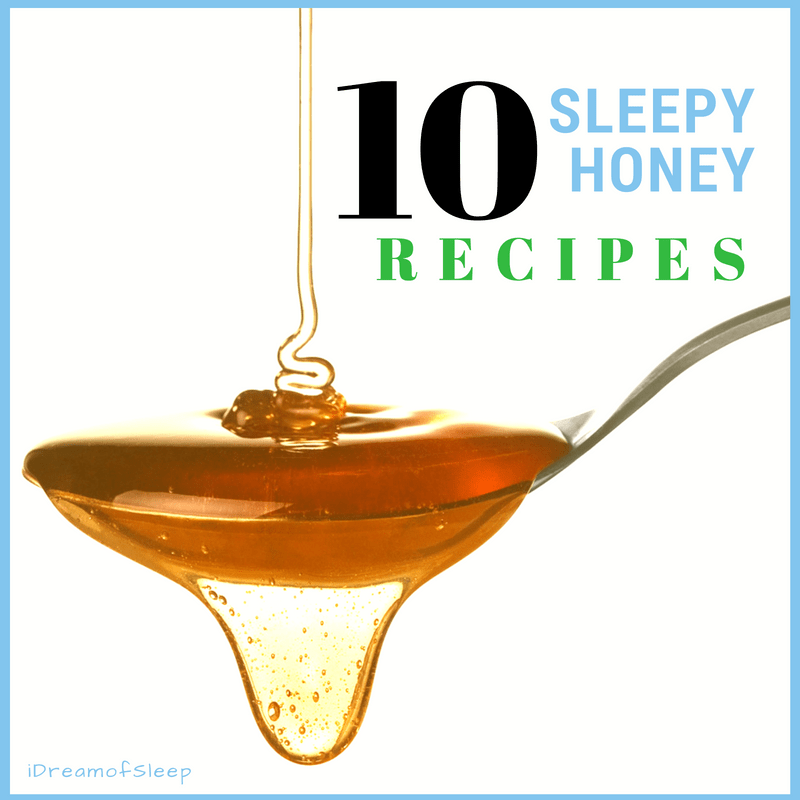 So taking remedies like a nutmeg and honey sleep drink likely won’t help you because it won’t address the anxiety that’s causing your insomnia. The result is you took a natural sleep aid, it didn’t work, and you’re left feeling defeated because it didn’t help you sleep and now you’re less likely to try other natural methods. Do I have problems falling asleep? Do I fall asleep okay but then wake up in the middle of the night? Do I wake up too early? Do I feel anxious about sleeping? Look at your answers each time you consider trying out a new remedy and see if it’s something that has the potential to help your symptoms. It will really cut your irritation levels and help you find a natural sleep remedy that will have more of a chance of working for you. My next question is always, “oh, okay. How many times did you try it?” 95% of people tell me one to two nights. I’m sorry, but there’s no way you can judge how effective a remedy is by just giving it a two night trial. Hey, it’s human nature. If something doesn’t work within a couple days, we ditch it and move on to the next thing. When in reality, some natural treatments can take weeks before you’ll start to see any benefit. For example, if your body’s magnesium levels get too low, it will cause insomnia. How long it takes magnesium to work is dependent entirely on your body. 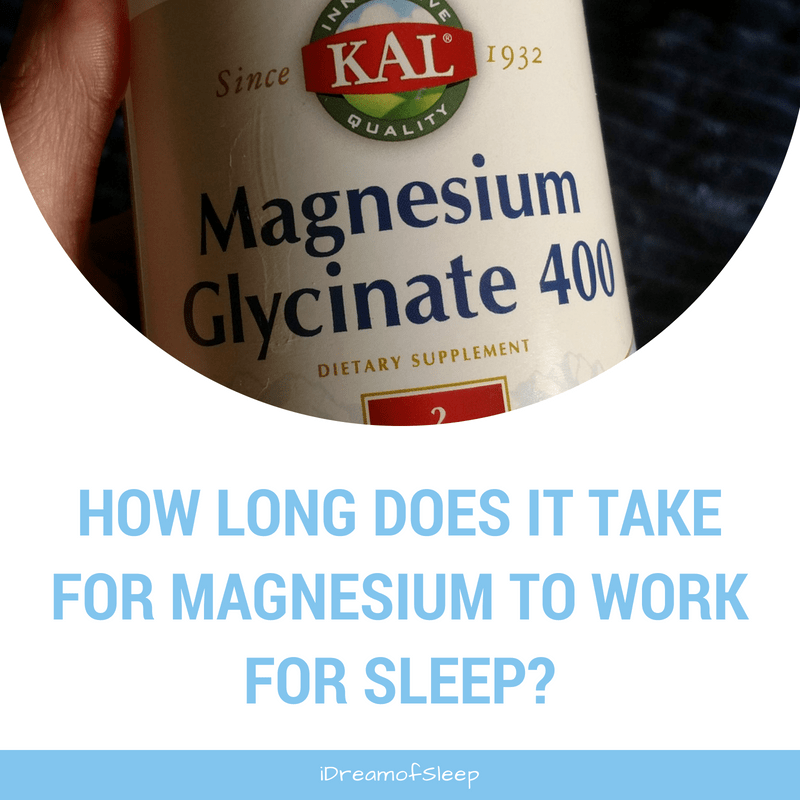 It could be weeks before your body has the proper amount of magnesium it needs to start the sleep process normally. If you’d stopped taking it after a night or two, you never would have gotten any sleep benefits from the magnesium and assumed it didn’t work. Most people have the misconception that a natural sleep aid is supposed to knock you out like a sleeping pill does. But I’ve got news for you, if that’s your expectation, you’re definitely going to be disappointed. 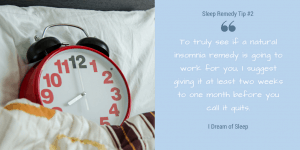 To truly see if a natural insomnia remedy is going to work for you, I suggest giving it at least two weeks to one month before you call it quits. You’re probably like, wait, what? But what if I find something that works and my sleep is glorious and I wake up feeling awesome and then you want me to just give it up??? I know it seems counterintuitive to stop taking a sleep remedy that’s helping you sleep and move on to something else, but when you’re trying to beat the monster that is insomnia it’s necessary. Think back to other natural remedies you’ve tried. Have you ever noticed that once you do find something that helps sleep it stops working after a while at you’re back at square one? That’s because your body became immune to that remedy. Regularly switching out what’s getting you to sleep helps delay that immunity and lets you keep taking it longer. So once you’ve found a few remedies that help, how does this rotation thing work? Let’s say that you’ve had success with chamomile tea, essential oils, and 5HTP. To rotate them, you’d use the tea for a week, then switch to essential oils the next week, etc, and then start all over again. 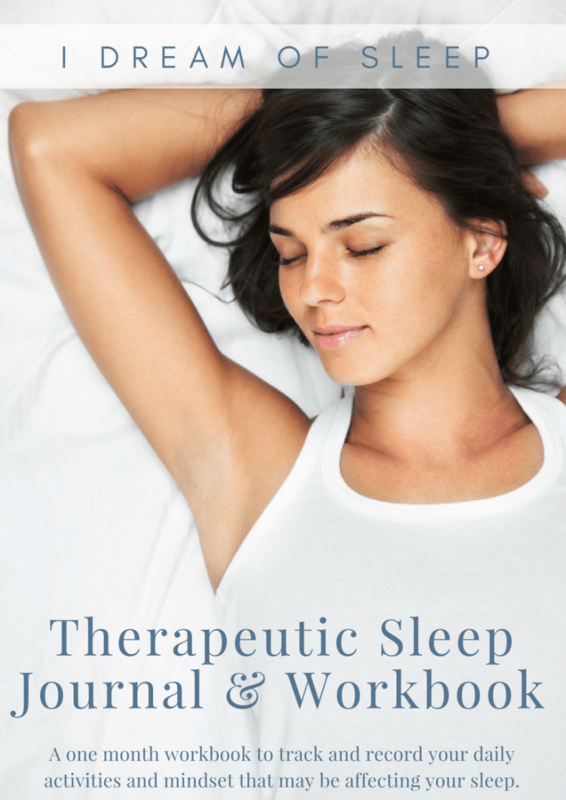 When you start taking a new remedy to help you sleep, do you write down how it made you feel, if it worked, or if anything odd was going on in your life that day that may have impacted your sleep? If you don’t, it’s something you should consider doing because you could be sabotaging that natural sleep remedy you’re using and not realize it. Recording things like I mentioned above will help you notice any bad sleep habits you have or if you were stressed out more than normal. 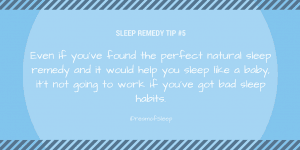 Those two things alone will affect your sleep negatively, and no matter which natural remedy you take it will have a slim chance of working for you. 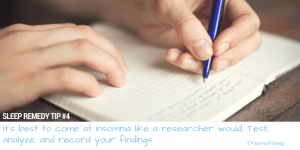 That’s why I think it’s best to come at insomnia like a researcher would. Test, analyze, and record your findings. Write down if you are stressed out or if you have any issues going on that day. Next, write down what remedy you’re using that night, and then each morning record if you noticed any change. Even if you’ve found the perfect natural sleep remedy and it will help you sleep like a baby, it’t not going to work if you have bad sleep habits. Things like watching TV and scrolling on your phone an hour before bed or drinking caffeine after 12 p.m will disrupt your sleep patterns. If you’re not having any luck with natural sleep therapies, check your sleep habits. Your bad sleep hygiene could be the reason why you’re not seeing results, and not the ineffectiveness of your sleep remedy. 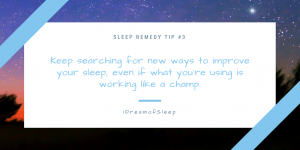 Developing a healthy sleep lifestyle is important in your fight against insomnia, and it will give your natural sleep aid of choice every chance of working. Sometimes, no matter how well you’ve researched a sleep remedy and how much time you’ve given it to work, you just don’t get the results you’re looking for. Everyone is different, and how each person responds to a natural sleep aid is going to be different. What works for me may not work for you and vice versa. Unfortunately, it’s just the nature of treating your insomnia naturally. Once you’ve given a remedy enough time to work, be sure you write down what you tried and the date you tried it in your journal. Writing the date is important because you’ll want to try that insomnia remedy again later. 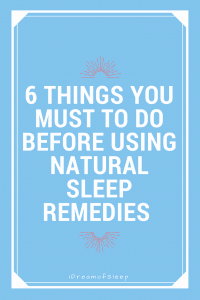 What makes finding an effective natural sleep remedy so difficult is even though you tried it this time around, it could work for you six months from now. That’s why it’s a good rule a thumb to never give up on a natural remedy completely and try it again six months or a year later. 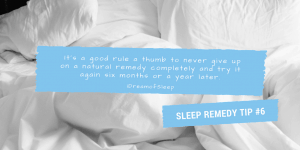 If you haven’t had luck with natural sleep remedies in the past, consider following these guidelines the next time you give a new remedy a go and see if you have better results. 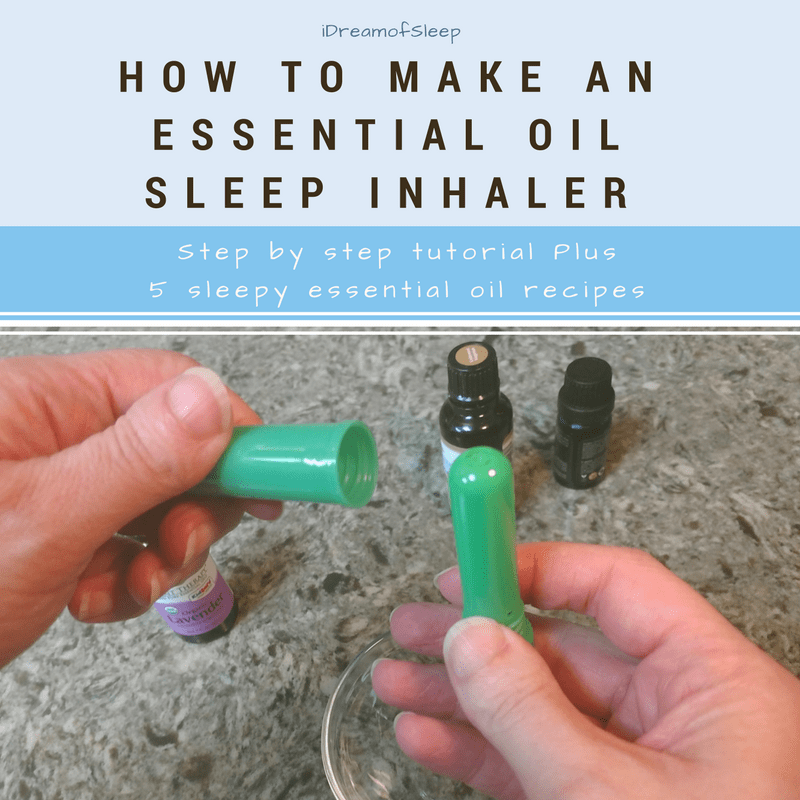 You can see how there’s a lot more that goes into trying a natural remedy other than just taking it before you go to bed and hoping for the best. Taking into account what keeps you up, giving it a fair chance, and putting it into rotation are all key factors when it comes to finding a natural sleep remedy that’s going to work for you. Above all, it’s important to not give up trying to fight your insomnia naturally. It’s aggravating, but curing insomnia naturally is a trial and error process until you find what clicks for your body.